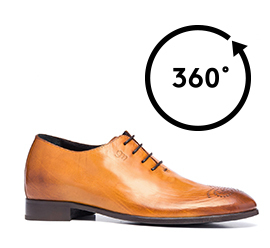 Elegant and luxurious, the new "Via della Vigna Nuova", elevator dress shoes by GuidoMaggi, are characterized by a particular wholecut upper in full grain cognac leather, hand punched to obtain the refined "medallion" tip. Via della Vigna Nuova are handmade using a single piece of leather without stitching. The inner lining is made of soft goatskin theinsole, midsole and outsole in genuine Italian leather, are joined and sewn at sight. The heel is in genuine leather with anti-slip rubber, the laces are cotton waxed. The invisible height insole - anatomical and tested - gives an immediate increase of 2.4 inches. The GuidoMaggi craftsmen allows many possibilities for customization.